← BREAKING NEWS! Raleigh City Council Approves Food Truck Ordinance! Cooke Street Carnival is back for another day of block party fun in Downtown Raleigh. 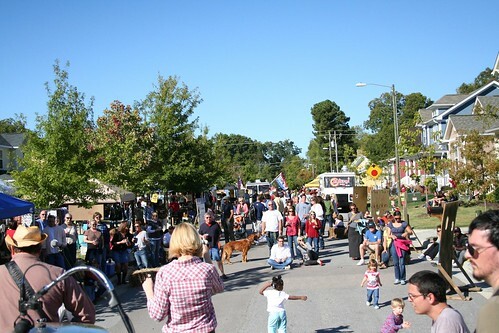 This year’s event, its third, will take place on the afternoon of October 15th, 2011 from 1-6pm on Cooke Street (between Lane and Jones streets –MAP) located in the Idlewild Neighborhood, just a few blocks East of the Governor’s Mansion in Downtown Raleigh. The event was inspired by the Notting Hill Carnival in London and Mardi Gras in London, as well as your typical Fall Festivals/Carnivals that happen all around the South each year. Each year, the Cooke Street Carnival brings together thousands of Raleigh’s citizens to celebrate local arts, culture and music. Over 30 Raleigh art vendors, local food trucks, a beer truck, multiple bands and a large group of artists and circus performers are expected to participate in the event. Local folk rock bands The Small Ponds, The Tomahawks and Nests will headline the entertainment which will also include a dunking booth (Bonner Gaylord has already volunteered to get dunked), kissing booth, pie eating contests, new art photo-opp boards (by local artists Raines Thompson, Kristin Matzinsky, Sara Phoenix and Jessica Robinson), activities for the kids and other carnival inspired antics. A drum circle will keep rhythm at one end of the street while Johnny Swank plays his guitar (made from a metal Frito Lays lunch box) up and down the block throughout the day. Oh, and Mr. Tony Woodard will once again return as the emcee. Food vendors will include Only Burger, Klausie’s Pizza, Slippin’ Sliders, Aviator Brewing, The People’s BBQ, Crumb, Pie Bird, Escazu Chocolate and coffee from Joe van Gogh with more to come. Artists and local businesses will line Cooke Street early in the morning to promote their ventures throughout the day. The carnival is an event originally started to foster community interaction and promote local artists, musicians and businesses. Compost Now, Good Girls Studio INC, Adam Peele, Metamorphosis Metals, Epona and Oak, City Blox, Amplified Art, DiggUp Tapes, Kinder Soles and City Fabric are just a few of the businesses that will be on hand selling and laying out their products for the community. Each of these are great examples of what it means to be a small business making their way in a big city. 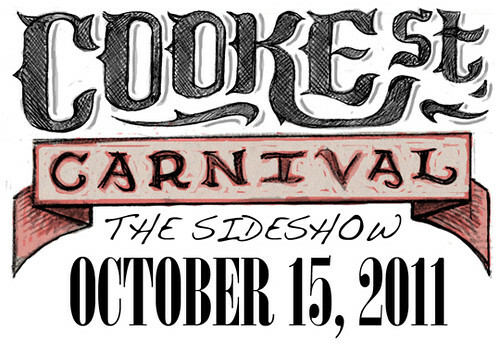 The theme for this year’s event is Cooke Street Carnival 2011: The Sideshow. Having played second fiddle to the NC State Fair each year, the carnival has decided embrace its sideshow nature and attempt to bring out as much Circus Sideshow themed activities as possible. Look for circus freaks all along the street and bring your own interpretation of what it means to be a 21st Century Sideshow freak. There will be a stilt walker, hoola hoopers, a bearded lady, a tarot card reader and more to entertain throughout the day. Also, costumes are encouraged. Each year, The Cooke Street Carnival picks a locally based charity to sponsor and this year it will be the Food Bank of Central and Eastern North Carolina. So bring out your canned foods and look forward to having a fun Fall time at a carnival in the street. Check out more info on becoming a vendor and more at the Cooke Street Carnival website and for full information on the event, see the Cooke Street Carnival 2011 Event Page over at Facebook.